You can follow this easy guide to enable two-step verification on WhatsApp for Android and iPhone to enhance the security level of your account. You can now enable two-step verification on Whatsapp for Android and iPhone. Technology giants such as Google, Facebook, Apple and Microsoft who had enabled this feature earlier to add more security for users. This feature had been under testing and only available for bets users for several months. 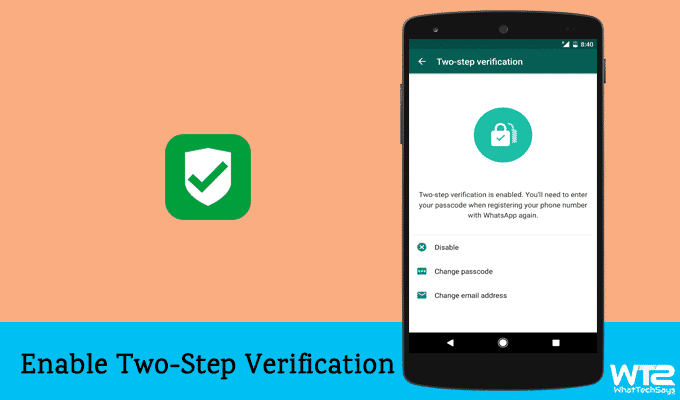 Now two-step verification is publicly available for all users. 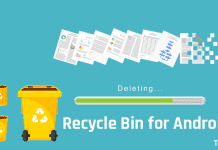 It provides an extra layer of security to keep billions of accounts safe from hackers. Before going to the tutorial, you should know what actually it is. When you enable two-step verification for your Google or Facebook account, they generate a one-time password and sent it to your phone to access your account. 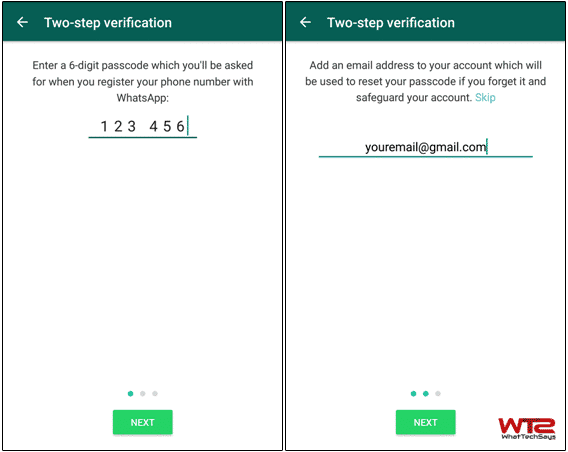 1 What is Two-Step Verification on Whatsapp? What is Two-Step Verification on Whatsapp? WhatsApp’s strategy to two-step verification varies from what others do. When you setup your Whatsapp account, it only asks for your phone number and then the one-time password. But, this is not enough for security. If two-step verification is enabled for your account, then you have to put an additional six-digit password which you have set before. Whatsapp will ask you for that code whenever you’ll try to login into your account from a different device. Verifying your identity is necessary. Suppose, someone has stolen your mobile and want to open your Whatsapp account, although he has access to your smartphone but couldn’t log in without the second password. Unlike other platforms, you need to put a six-digit passcode as your two-step verification password as the messaging app doesn’t generate a verification code. So, let’s get started to enable two-step verification on Whatsapp. 1) Open Whatsapp on your Android device. 2) Go to Settings → Account → Two-step verification. 3) Here, tap on the green “Enable” button. 4) On the next screen, enter a six-digit passcode and do the same on the next screen. 5) Optionally, add your email address on the next screen and also confirm it. This will help you to reset your passcode if you forget it. Now you are done! The last step is optional. Whatsapp asks for your email address to link to your account. You can also skip this step if you don’t have an email id. But, if you forget the code, Whatsapp will send you a link via your email id to disable two-step verification in your account. If you no more want to keep allowed two-step verification for your account for any personal purpose, it is simple to turn it off. 1) Open WhatsApp → Settings → Account → Two-Step Verification. 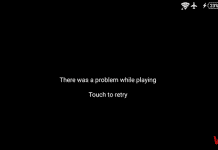 2) Now, tap on Disable. That’s it. The activation process for iPhone is same as the Android. You just need to open Whatsapp from your home screen. Then go to Settings → Account → Two-Step Verification. Now, you need to set a six-digit passcode as two-step verification password to provide an extra level of security for your account. The email id is also optional in this case. If you don’t want to add your email id, simply tap on Skip. Whatsapp will not send any verification email to verify your email id. In case you forget the two-step verification password, WhatsApp won’t allow re-verifying the account within seven days of last using WhatsApp. After seven days, you will be able to verify your account without the passcode, but you will lose all older as well as pending messages. If you haven’t used your Whatsapp account for 30 days and then try to reverify without the passcode, your account will be deleted and a new one will be created for you. This was the complete tutorial on how to enable two-step verification on Whatsapp for Android and iPhone. 2-step verification is the essential function which makes your account more protected. Update your Whatsapp now and enable this fantastic feature.